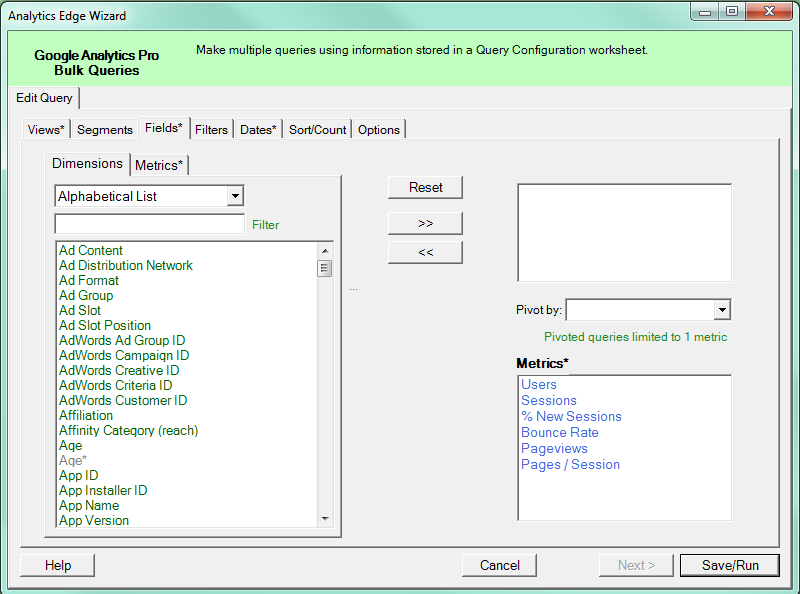 Use this Analytics Edge wizard to select the dimensions and metrics to be retrieved in the query. Select a field in the listing on the left and click the [ >> ] button, or double-click on the field name to add it to the selected field list on the right. Dimensions and metrics are managed separately. You can add up to 7 dimensions and 10 metrics in a query. Not all combinations are valid. To see Google’s authoritative listing, click the link provided on the wizard. Invalid selections will appear gray in the list. Items marked with an asterisk (*) are deprecated by Google: this means that while they still work for now, they will stop working at a future date. In most cases, there is a second metric or dimension with the same or similar name. e.g. “Users” refers to the API field ga:users, but “Users*” refers to the old ga:visitors API field, which has been replaced by ga:users. After selecting your dimensions for the query, you can select one of those dimensions to segment the results into columns. For example, you can select the Date dimension to obtain one column per Date in the results. Note that the columns will be created in the order in which they appear in the query, so changing your sort order may affect the order of the columns. Also, there will be one column for each unique value, so absolute column position may change from query to query. 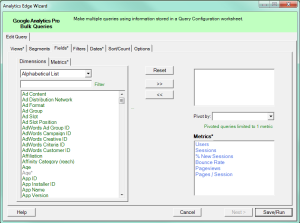 For more control over pivoted resulted, use the Pivot function in the Analytics Edge Core Add-in. This entry was posted in Google Analytics on 2015/07/05 by functions.